The weather is warming up. That means the return of warmer days and lots of sunshine. While this can be a welcome change, it also presents some unique challenges for senior citizens and people with chronic illnesses. Seniors are particularly at increased risk for some specific concerns in the heat due to overheating. Medications, transportation issues, overdressing for the weather, and hot homes are just some of the reasons seniors are at greater risk of getting overheated. But becoming overheated is especially risky for seniors because dehydration occurs more easily, which can become life-threatening. Don’t take chances on trying to manage this alone; let homecare help keep your loved ones safe during the hot summer. Many older adults live in homes without air conditioning or on fixed incomes which drive them to use air conditioning less to save money. As a result, the risk of heat stroke from inside their homes goes up. Home healthcare can help to prevent some of the serious and dangerous outcomes related to heat exposure simply by monitoring the home environment. Similarly, many seniors may have difficulty regulating their internal temperature and may not recognize how hot it is. They may be dressed too warmly for the weather and be unable to cool down. They may also have to use public transportation or walk to places in the heat, which puts them at additional increased risk. Having a caregiver who can monitor and intervene can be a literal life-saver. Many medications can cause dehydration and difficulty in regulating body temperature. Some medications cause the body to require more fluids to stay hydrated. It’s important to have someone providing regular oversight and medication management. Many doctors don’t consider the cumulative effects of multiple medications or observe the daily health condition of the patient. Overheating and dehydration can set in quickly, but fixing the problem requires an observant caregiver. Assisted’s Caregiver Services Aides can monitor seniors for signs of being overheated, such as dizziness, thirst, nausea, muscle cramping, and swollen ankles. 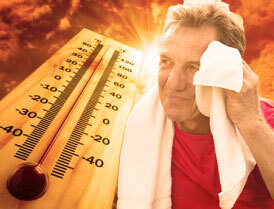 More serious indicators include increased body temperature, confusion, fainting, and lack of sweating despite the heat. Fortunately, caregivers can help seniors adjust and adapt to the environmental conditions. You can help to prevent dehydration and heat-related illness by encouraging consumption of lots of clear liquids, dressing appropriately in light-colored and light-weight clothing, and limiting physical activity to cooler parts of the day. Sometimes active management is the best way to deal with hot weather, but seniors may need a bit of help finding alternative options. Encourage them to take regular cool showers or baths to keep body temperatures low. Discourage cooking, particularly using the oven, which would heat up the entire house. In particularly extreme periods, such as extended heat waves, seek out temporary shelters. Most cities have temporary shelters set up as places to escape the heat during extreme heat waves, which is especially important for those who lack indoor air conditioning. This article was posted in Caregivers and tagged Heat.